Sterling Silver Shield Pendant Fob Watch Chain Antique Victorian 1894 English Hallmark. Fantastic sterling silver shield pendant fob dating from the 1920's attached to this antique Victorian albert watch chain. The chain date letter & assay office mark can be found to the link where the T bar pendant is attached, Birmingham assay office with the date letter for 1894. This date letter is also found on the dog clip clasp as well as the T bar pendant. The links of the chain are marked with the lion mark. The pendant fob dates later & is fully hallmarked to the rear, again the Birmingham assay office but with the date letter for 1928. Both sides of the fob are blank. Good secure dog clip clasp with a good spring. The chain is long enough to be converted into a chain necklace. Length 41.0 cm or 16.1 inches. Width of chain 0.8 cm or 0.3 inches. Size of fob including bale 3.8 x 2.5 cm or 1.5 x 1.0 inches. Weight 52.7 grams or 32.9 penny weight. 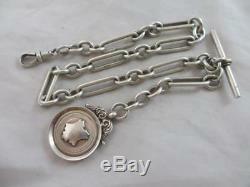 Sterling Silver Shield Pendant Fob Watch Chain Antique Victorian. We are topbananatetbury the best kept secret. Note: all items are in good antique vintage condition unless otherwise stated. 31.1 gram troy = 1 troy ounce. INTERNATIONAL ITEMS ARE SENT BY INTERNATIONAL SIGNED FOR. This is by far the cheapest and most secure way of sending multiple items. 00gbp by International Signed For. Get images that make Supersized seem small. Tailor your auctions with Auctiva's. The item "Sterling Silver Shield Pendant Fob Watch Chain Antique Victorian. Tbj05173" is in sale since Sunday, September 30, 2018. This item is in the category "Jewellery & Watches\Vintage & Antique Jewellery\Vintage Fine Jewellery\Victorian (1837-1901)".